The Krakatoa eruption of 1883 created pyroclastic flows that traveled across the surface of the ocean to nearby islands. The hurricane force winds with super-heated gases and rocks burned many people living on near by islands. The pyroclastic flows also created tsunamis that sand ships and destroyed villages on the shores of nearby islands. Prior to 1883 the three volcanoes that made up Krakatoa island had not erupted for over 200 years. Then steam and gas eruptions began in the spring of 1883 delighting passing ships and villagers living in the region. The climatic eruption started at noon on August 26 with an explosion that shot a cloud of black ash and pumice about 25 kilometers into the air. The climatic eruption continued all afternoon and into the night. Early the next morning four great eruptions began about 5:30 am culminating in a blast that blew two-thirds of the island away creating a six kilometer wide caldera. These eruptions were heard through out the Indian Ocean and as far away as Australia. Nearby island were battered by pyroclastic flows that generated tsunamis. Ash and pumice continued to be blown into the air covering nearby islands with layers of ash and pumice. Pyroclastic flows generated tsunamis that swept over nearby islands sweeping over 3000 people into the ocean from just one island. The Dutch estimated approximated 36,000 people died during these two days. Ninety percent of the people were killed by tsunamis. Ten percent were killed by pyroclastic flows that flowed across the ocean to nearby Java and Sumatra which were still hot enough to burn people to death with the hot gases and rocks in the flows when they came ashore. 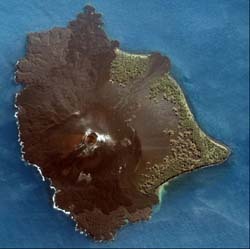 Today Anak Krakatoa in the image above has grown into a small island in the caldera formed by the 1883 eruption. The volcano is still active and is closely monitored by geologists. Vesuvius Eruption The Vesuvius eruption was observed by Pliny the Younger who wrote an eye witness account of the eruption. Shield Volcanoes The Hawaiian shield volcanoes are the largest volcanoes on Earth. Super Volcanoes Super volcanoes produce huge amounts of ash and pyroclastic material that can alter the weather for years. Pyroclastic Flows Pyroclastic flows travel down the flanks of volcanoes at hurricane speed destroying every thing in their path. Volcano Rocks There are four major groups of volcano rocks formed during volcanic eruptions. The Krakatoa Eruption During the Krakatoa Eruption pyroclastic flows swept over the surface of the ocean to other island.